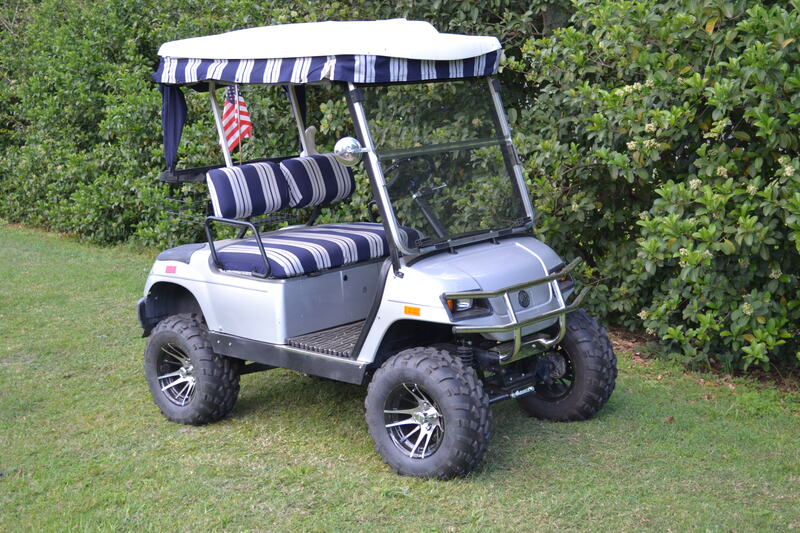 Battery Boys is now selling a variety of used Golf Carts! Several carts are available and inventory changes quickly, so be sure to give us a call at 352-643-1241 to find out details on each of our carts in stock. Our hours of operation are 8am – 5pm, M-F. Messages can be left 24/7 on our after hours messaging center as well as submitted through our web site. 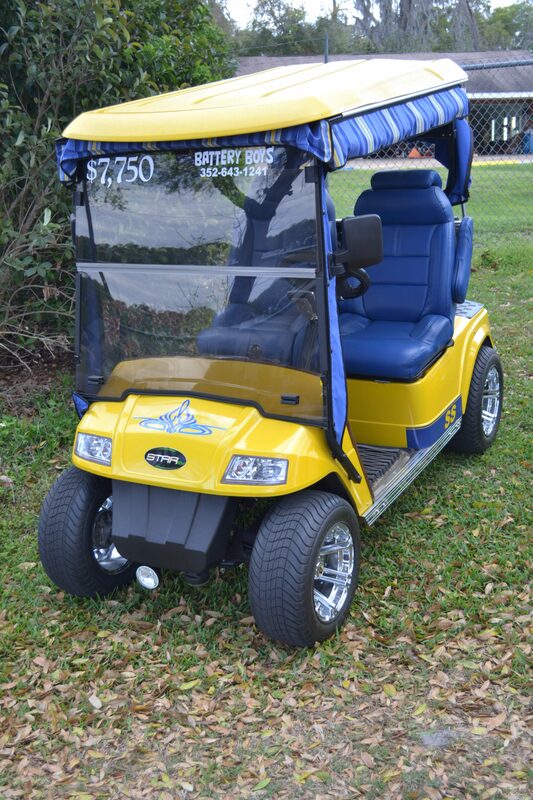 2013 Star Car: $7,750.00; cart is fully loaded with upgraded 12 inch chrome rims and tires. Woodgrain dash, carpeted floor mats, high back custom seats. Less than 1 year old Trojan T-105 batteries (8 – 6 volt for greater distance). Batteries have a Battery Watering Technology auto fill gravity system. This was a one owner cart driven less than 100 miles since new. Yamaha 48 volt, $5,250.00; 6 – 8volt set up. Less than 1 year old T-875, still under warranty. Custom lift kit with new 12 inch custom rims and knobby tires makes this a perfect hunting/beach/off road cart. Chrome brush guard front bumper. Runs out at 20 MPH. 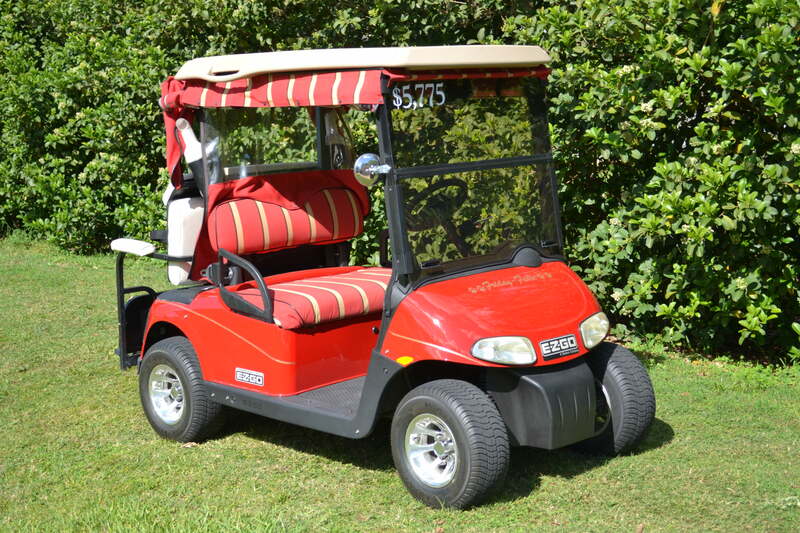 2009 EZ-GO RXV 48 volt cart: $5,775.00; Converted from 4 -12 volt to 6 – 8 volt batteries that are less than a year old. This gives greater distance per charge. Has a Stow-N-Go rear seat allowing for up to 4 passengers but easily folds up for golf bags. Custom rims with 10 inch tires. AC motor locks brakes when not in motion plus this cart accelerates going up hills.